While renovating a tired home entrance, this Southeast Wisconsin client had a unique opportunity to introduce a more formal courtyard to their French provincial home. The existing courtyard landscape included a free formed network of faded brick walks surrounding a flowering ornamental tree. While the tree provided some relief from the southern sun in the summer, it completely blocked views out of the home's great room, so it was removed in the final plan. However, many of the foundation plantings remain in the redesigned space. A linear layout of natural bluestone paving allowed for a more functional area which includes a sitting niche where a bistro table and chairs will be added. The unplanted square under the picture window will accommodate a recirculating water feature surrounded by flowering perennials. Sleeved piping below the bluestone paving allows for easy electrical installation. The framework for the courtyard space is a columnar hedge of Hicks Yews, and two low piers at the driveway entrance. Urns planted with annuals in the summer, and illuminated metal lanterns in the fall and winter will add visual interest. 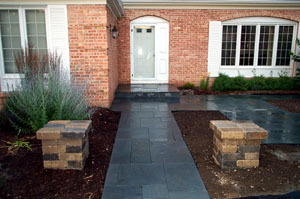 The piers are constructed with Unilock Brussels Dimension Stone, in a Grey/Prairie blend. The patio construction was completed in six working days. The plantings are scheduled to be completed in the summer of 2004.